Creation of the U.S. Postal Museum began in 1995 through the efforts of Postmaster Joe Guthrie (Deland, Florida) and postal historian and curator, Richard Feinauer. The museum started as a collection of displays temporarily housed in a ten by sixteen foot room inside the Deland Post Office. 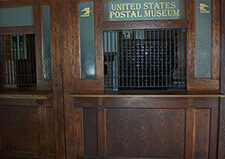 In 1998, when the Post Office relocated, a new, permanent home for the display was needed. Orange City is seemed very well suited for a postal museum since the city and the surrounding area are at the origin of Volusia County's history. Back in 1876, the first Post Office for the area, later to be known as Orange City, was housed in the very same building as the museum now resides, 129 years later! In 1886 a Post Office was established at Blue Springs Landing, on the St. Johns River. Ten years later, the Post Office was again relocated to Orange City( do you know where) and the name was changed to the Orange City Post Office. The Museum was established for the preservation and appreciation of postal history and postal artifacts. Through the efforts of the United States Postal Service and private individuals, there now exist numerous items on display that represent all phases of the U.S Postal Service from inception to the present time. Walk inside a recreated Post Office from the 1940's. Visitors will see various artifacts, paperwork, books, forms, and clothing used over fifty years ago. Observe up close many postal artifacts, which have all but disappeared from modern day postal facilities. Learn about mail processing, mail delivery, stamps and postmarks. Explore the 80 foot hallway lined with over 100 shadow boxes full of postal memorabilia and hundreds of envelops categorized with such topics as slogans, Army/Navy, and many more. Find the world's largest postage stamp (???) and the one with the earliest date. Visit the special display on Orange City postal history. (Richard, would like to get this). Search through hundreds of stamps which are "free" for the taking. 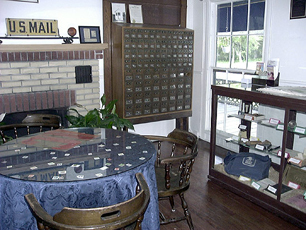 The Florida Postal Museum is a non-profit establishment operated by a dedicated group of volunteers; many are from the Central Florida philatelic community. Funding for the Museum is from donation only. An on going task for the museum is procurement of additional material to add to the displays, either as a donation or on temporary loan. If you would like to donate any philatelic material or make a monetary donation to the museum, please contact us at the email address below. The museum is also looking for members and volunteers to work on many projects. The Museum is conveniently located just 30 minutes from Orlando or Daytona Beach in the 1876 Heritage Inn at 300 South Volusia Avenue (Highway 17-92) in Orange City, Florida. The Museum is open everyday from 9 am. to 6 pm. 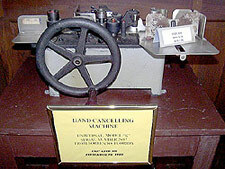 for self-guided tours. Narrated tours are available with advance notice for tours of eight or more. For more information, please contact the curator at FloridaPostalMuseum@1876HeritageInn.com.